Camden trade union council are shocked that Conway Hall is to host an event which will give a platform to the racists and Fascists of the English Defence League (EDL). On the 4th October Tommy Robinson, leader of the EDL, has been invited to speak at an event organised by the Muslim Debate Initiative. Conway Hall has a proud tradition of hosting events organised by the Socialist and Trades Union movements and has the respect of countless organisations. We ask you not to tarnish your reputation and also ask the organisers of this event to withdraw their invitation. The EDL has a sordid history of racist abuse and violence. The EDL leaders were members of the Nazi BNP and EDL thugs have attacked Trade Unions, bookshops, and socialists. Last year they attempted an attack on Conway Hall during the ‘One Society – Many Cultures’ event. This invitation is misguided and can only boost the confidence of the EDL. The EDL desperately need this event – as they fragment in the face of continued opposition every time they march. The EDL suffered a serious set-back when thousands turned out to oppose them in Waltham Forest on Sept 1 and stopped their march. They should not be given a chance to recover. Cancelling this event would continue to isolate the EDL. Please cancel this booking. 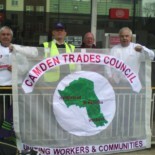 This entry was posted on September 24, 2012 by CAMDEN TRADES COUNCIL.